It is very difficult to dehydrate for biochemical sludge owing to its high organic content and strong hydrophilic colloid. So city and industrial wastewater commonly used activated sludge treatment. According to the nature of the sludge, the appropriate cationic could be applied, which can be effective in the sludge into the filter before the gravity sludge dewatering. The dehydration will result to floc large, non-stick filter cloth, in the filter does not disperse, with less, dehydration high efficiency, mud cake moisture content of 80% or less. Polyacrylamide treatment of sludge for the role of dehydration Principle: The flocculants prepared into the aqueous solution into the waste water, will produce a compressed double layer so that the suspension of suspended solids in the stability of the particles, the mutual aggregation of particles to increase particles to form flocs, alum. Flocculation grows to a certain volume after the action of gravity from the water phase precipitation, thus removing a large number of suspended solids in the waste water, so as to greatly improve the effect of sludge dewatering. But also can reduce the moisture content after dehydration, improve work efficiency. 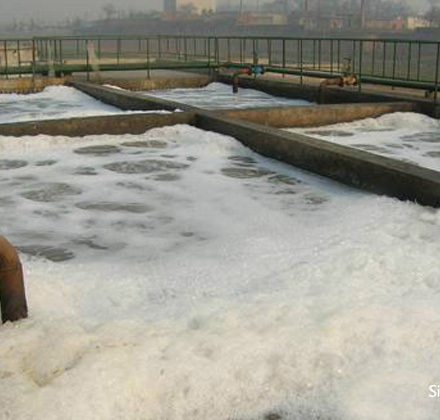 Sludge dewatering flocculants mostly are polyacrylamide, including anionic polyacrylamide and cationic polyacrylamide. In the sludge, the role of the principle polyacrylamide are neutralization and adsorption bridge for the nature of the small particles of sludge flocculation large precipitation, and then in the centrifuge or track machine for mud separation. Sinofloc polyacrylamide used for sludge dewatering has advantages of less dosing, significant effect, and very competitive price. Our products can be widely used in the purification of drinking water, domestic sewage; purification of industrial water, industrial wastewater; purification mine oil field water; clean paper, dyeing and finishing, metallurgy, coal washing, leather and various chemical wastewater. Our polyacrylamide could quickly achieve the desired treatment results, and to reduce the production costs of the enterprise.